About a week ago a third party analytics firm told us that iOS 12 was already running on 47.54% of compatible Apple devices, a very short time after its release. Today the Cupertino company itself has published official adoption data. As of October 10, iOS 12 was installed on 50% of all compatible devices, and 53% of devices introduced within the last four years. iOS 11 is understandably the second most used version, coming in at 39% (of all devices) and 40% (of four-year old devices and newer). 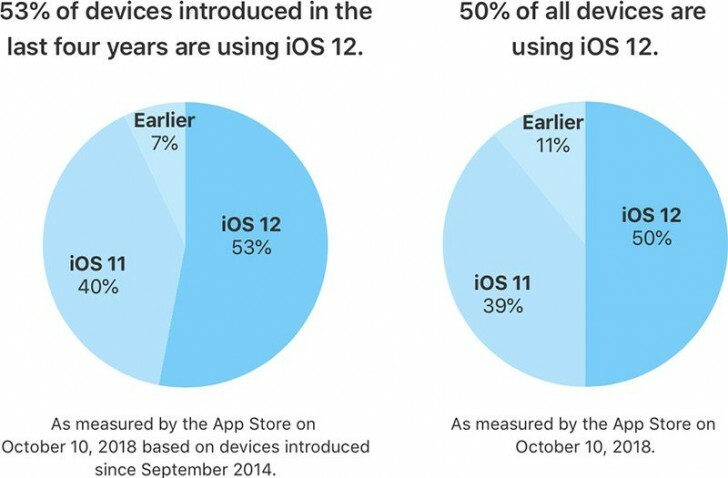 Previous iOS iterations only make up 11% and 7% of the pie, respectively. As usual, Apple’s mobile software is very rapidly adopted by consumers who own its products, in a stark contrast to Android, where an update needs to go through the company making the specific phone you have after it’s been released by Google for its devices (which aren’t selling in high enough numbers to make an impact in the charts). iOS 12 has managed to outpace the adoption that its predecessor managed last year. In early October, that version was only on around 38.5% of devices, taking it until November to reach 50%, based on Apple’s official numbers. On the other hand, the iOS 12 numbers are on par with the growth of iOS 10 back in 2016. On this day two years ago, iOS 10 was found on 54% of active devices. It comes as no surprise that iOS 12 is more successful than iOS 11, given the latest version’s improvements in performance for older devices, which make them feel much faster than before. On the iPhone 6 Plus, apps now launch up to 40% quicker, and the keyboard can appear 50% faster. Opening the camera from the lock screen now happens around 70% quicker. Additionally, animations are smoother and more responsive, as is scrolling in apps or entering the multitasking view. Apps even launch up to twice as fast when the device is under a heavy load, as does the Share sheet.